Tennis Thanks the Troops & Challenges TH7 Participants! 14. In 2006, the United States Open became the first Grand Slam event to adopt the Hawk-Eye instant replay system. The first instant replay challenge came from an American when he questioned a line call during an August 2006 match. Count the number of letters in his first and last name. Place your answer in 5-H and 7-F. Even if you’ve never picked up a tennis racket, you can certainly appreciate the history of the sport. While we’re on the subject, did you know that the USPTA has teamed up with ThanksUSA to raise scholarship funds through Tennis Thanks the Troops? 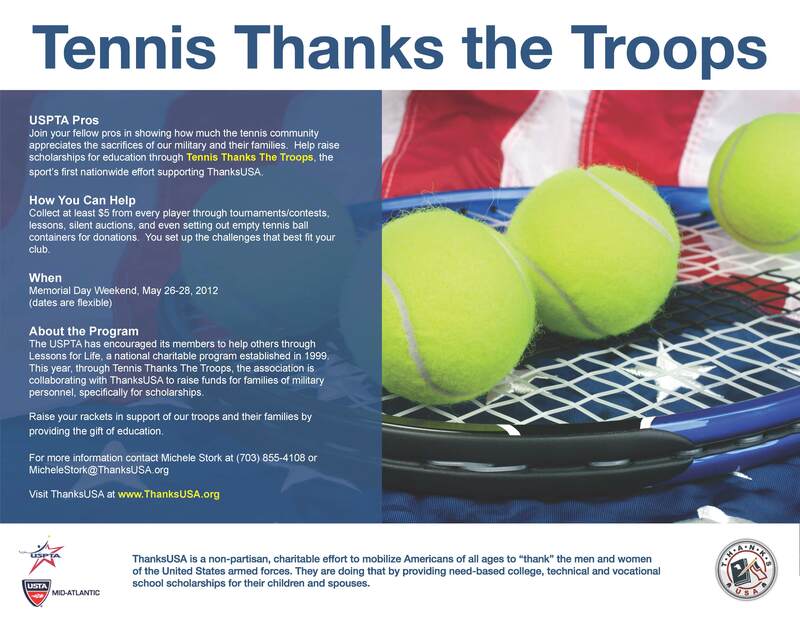 Tennis clubs across the nation will be making donations in support of ThanksUSA Scholarships by hosting Tennis Thanks the Troops events. Many clubs have already scheduled events for Memorial Day weekend, but any day of the week or weekend will work – make Tennis Thanks the Troops part of your weekly schedule or an addendum to an already scheduled tournament. If you are a member of a tennis club, be sure to share this link with your pro…the club raising the most money for Tennis Thanks the Troops will be able to send their pro and one guest to New York for the US Open on August 31! The US Open Prize includes airfare for two, one night’s hotel accommodations in New York City, plus two (2) tickets to the US Open. To be eligible for the US Open Prize, your check or on-line donation must be received by July 15, 2012. Prize Sponsored by USTA Mid-Atlantic.